Lane didn’t leave the devastation that many feared it would. It did leave Hawaii with a new standard for storm preparation. The most serious hurricane threat to Hawaii in 26 years brought something else with it — unprecedented cooperation between government agencies and the private industries that help keep the islands running, those involved in the response say. With Hurricane Lane veering toward Oahu on Friday, the usual suspects gathered at the state’s emergency operations center inside Diamond Head to brief the press. There was Gov. David Ige, Honolulu Mayor Kirk Caldwell, representatives from the National Weather Service and the Federal Emergency Management Agency, among others. But they were joined by other figures not typically spotted in that concrete bunker carved into the iconic Oahu crater: directors from the shipping firms Pasha, Matson and Young Brothers; executives from Hawaiian Electric Co. and Hawaiian Telcom; representatives of the state’s airlines and healthcare sectors. 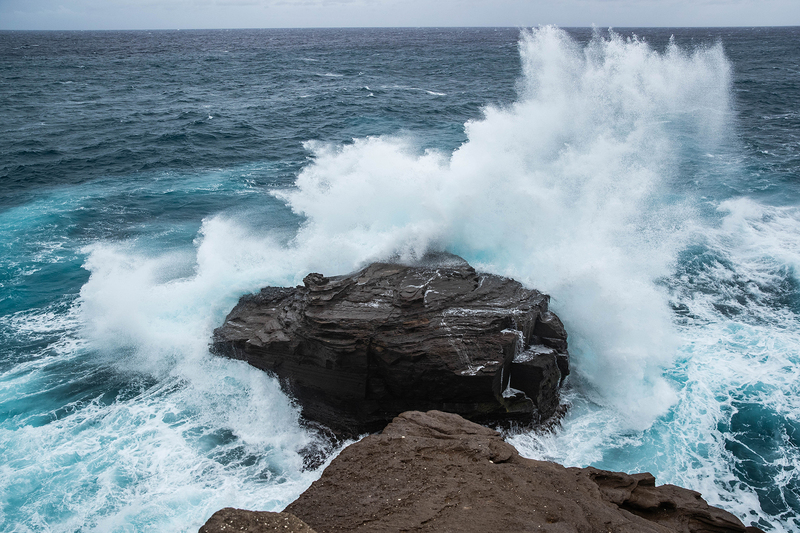 Waves crashing during high tide at Spitting Cave Cliff on Friday as Hurricane Lane neared Oahu. At the briefing, HECO President Alan Oshima looked to dispel rumors that rolling electrical outages were happening. Blaine Miyasato, who co-chairs the state’s Airlines Committee, told reporters he hadn’t seen any price-gouging for fares to get to and from Hawaii. Matson Senior Vice President Vic Angoco reported his shipping company had 665 containers at the port ready for delivery once Honolulu Harbor could reopen. On Monday, Ige said he wanted the company leaders at that Diamond Head briefing so they could answer the public’s questions directly. The state was getting multiple queries about Hawaii’s supply chain and the potential lack of food and water, he added. 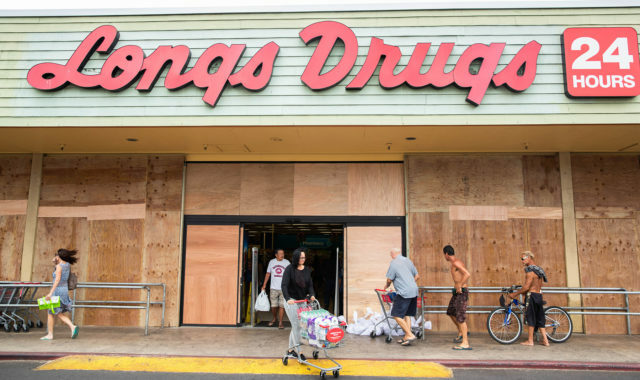 Homeowners and businesses, such as this Longs Drugs in Waianae, spent days preparing for Hurricane Lane’s arrival, spurred in part by a drumbeat of official warnings and alerts. State emergency officials regularly check in with local utilities and companies when preparing for an emergency, Ige said. However, he wasn’t aware of a previous instance in which all of those public and private entities met in the same room to respond to a real-time threat. In many ways, the heightened coordination makes sense. Based on forecasts, Lane had threatened to do catastrophic damage to Hawaii, with an Iniki-like track aimed at the state’s most populous islands and critical ports before shear winds suddenly broke the storm apart. 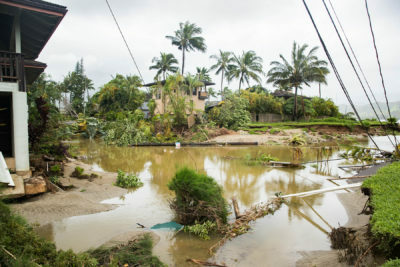 The storm did cause severe damage nonetheless, mostly on the Big Island, where rivers raged near Hilo and nearly 40 people had to be rescued from homes. As a tropical storm, Lane ranked as the No. 3 rainmaker from a tropical cyclone in the United States since 1950. 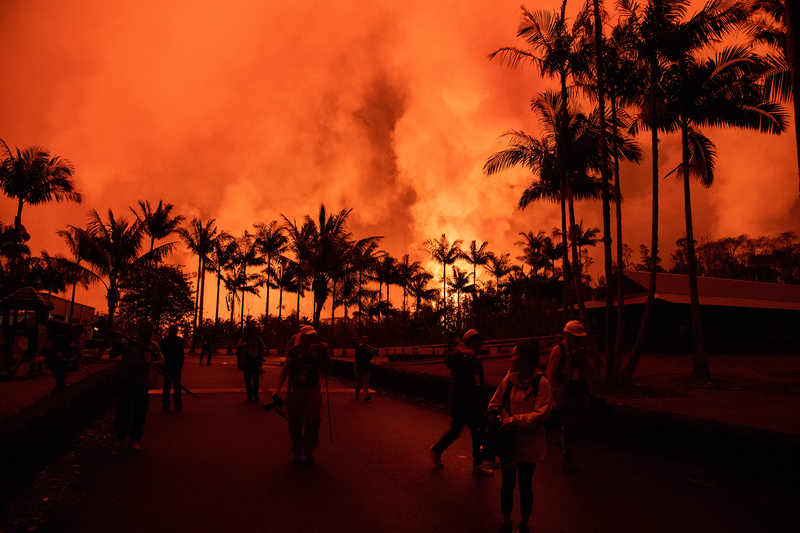 On Maui, crews battled a massive fire stoked by the storm’s winds. North Shore Kauai residents, meanwhile, grappled with an incredible sense of deja vu Monday as communities still recovering from historic flooding in April found themselves again submerged. Relentless rainfall on the Garden Island caused flooding that forced the shutdown of numerous North Shore bridges, roads, businesses and schools. As they geared up for Lane last week, federal, state and county disaster-response officials already had an advantage: They’ve been responding to disasters in Hawaii together for four months straight. 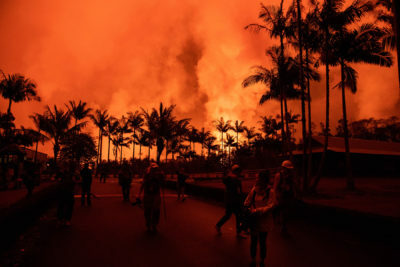 “We went straight from supporting the county of Kauai in its disaster of the flooding… straight into lava,” state adjutant general Maj. Gen. Joe Logan said Monday, referring to the latest Kilauea eruptions on the Big Island. State and federal emergency officials learned key lessons from the massive rains and flooding that hit Kauai in April. To keep that constant familiarity up, “unfortunately, you need constant disasters,” Logan said with a chuckle. But he added that the agencies will continue to meet and conduct emergency exercises. For Lane, Hawaii also saw a “huge” FEMA presence on the ground that’s “trying to get ahead of the game” during this year’s hurricane season, said Scott Seu, HECO’s senior vice president for public affairs. On Seu’s flight back to Hawaii last week ahead of the storm, a flight attendant announced that a team of FEMA agents was on board, he said. “The whole plane cheered. I think everyone understands, given the context that we’ve seen — and Maria — that no one can go it alone,” Seu said, referring to the hurricane that devastated Puerto Rico this past September. A lava fissure on the Big Island spewed lava hundreds of feet into the air in May. Many homes were lost and thousands of people were evacuated during the flows. Seu further recalled an instance about 10 years ago when the then-governor and then-mayor of Honolulu held dueling press conferences to address a potential emergency. “In today’s environment and Hurricane Lane there was none of that,” Seu added. One takeaway from Lane so far: The state needs to find ways to respond to a disaster in a scenario without planes and helicopters, Ige said. Lane approached Hawaii from the south and that prompted officials to shut down all of the state’s military airfields, similar to the closure of all the state’s harbors, Ige said. Those closures left valuable air assets grounded, Ige added, including the Air Force Reserve’s Hurricane Hunter planes that could have gathered more critical data on a storm’s path prior to its arrival. Gov. 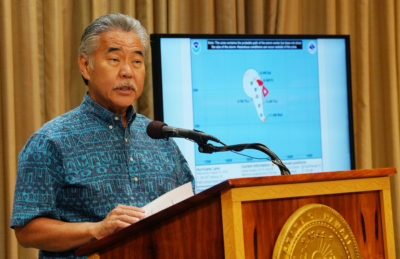 David Ige presides over a Hurricane Lane press conference, one of several press briefings during the run-up to the storm. Depending on how long those air fields stay closed during future storms, responders may be unable to reach communities isolated by rains, flash floods and landslides, Ige said. The state will need to plan ahead with creative solutions to reach such communities, the governor added. A new storm in the eastern Pacific — Miriam — is expected to become a hurricane next week as it nears Hawaii. For Caldwell, last week’s coordinated response to what could have been one of Hawaii’s most destructive storms should be a guidepost for the future.